A few weeks ago, I ran my 7th half marathon since 2010. I am the busiest I've ever been, but still somehow managed to set a personal record and finish the race in 1:38:05. My current schedule is filled with the work of a full-time MBA program, hours at a part-time internship, other outside responsibilities, maintaining my personal blog and Instagram, planning a wedding back home in NJ, and still managing to be some type of social 26-year old. A few years ago, I made it a goal of mine to run a half marathon in a new city each year. One of my favorite things about running is discovering areas that you wouldn't normally see just walking or driving around. Last year I ran Seattle, and when the school year started back in August, I decided to dedicate this year to Austin. I was fully aware when signing up for this race that I was going to have to find a way to train that wouldn't entail miles and miles and hours upon hours of running each week. If anything, most days during the week I only workout for 30-40 minutes max... so that translates to a couple 4-5 mile runs at a time. And you want to know something? I barely even ran outside. 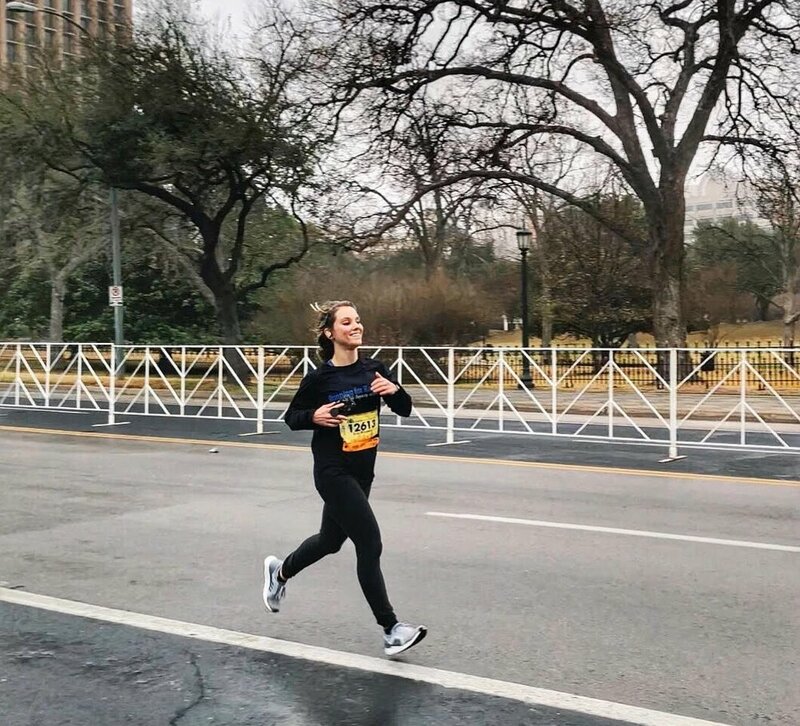 I know this is contrary to what you'll find on probably every other running blog and race training forum out there, but you DON'T HAVE TO DO A LOT OF RUNNING TO BECOME A BETTER RUNNER. 3-4 days of running per week, MAX. Most running on the treadmill with drills specific to speed, endurance, and hill training (check some out below!). I have found that the ability to control my speed and incline helps so much when I get outside. 1-2 outdoor runs. Ideally, I would like to do more, but with work/school/life and not the easiest access to trails right now, the treadmill is sometimes just more efficient. Functional exercises on off days. What do I mean by this? Body-weight circuits, resistance training (with weights or resistance bands), and other forms of exercise to strengthen abdominals, mid-section, glutes, and cross-slings. You'd be surprised how much faster and how much longer you can run when you have a strong body to power you through. Gradual distance increase as race approaches. I didn't ramp up the distance too much too soon. Distance doesn't equal progress. I've found that 4-5 miles at an all-out pace (slightly faster than race pace) can be just as effective as a 7 mile run (at or below race pace). REST - I try to workout for at least 30 minutes 6 days a week, but sometimes you have to listen to your body when it tells you that rest or sleep is more important. Know when to push yourself, and know when to give yourself that break. Repeat this 4-5x - no rest in between! Essentially all of what I do on the treadmill is an alternation of speed and incline at paces slightly faster than my target race pace. For more treadmill inspiration, check out my Instagram! Hopefully this serves as somewhat of a guide to anyone that hopes to become a faster runner but feels like there is NO time. YOU CAN DO IT! Remember! Less is more if you focus on quality. Next year, I'm making it a goal to get somewhere under 1:38 and I'll be applying many of these principles! Feel free to reach out directly with any questions, comments, or suggestions! I'd love to hear from you!